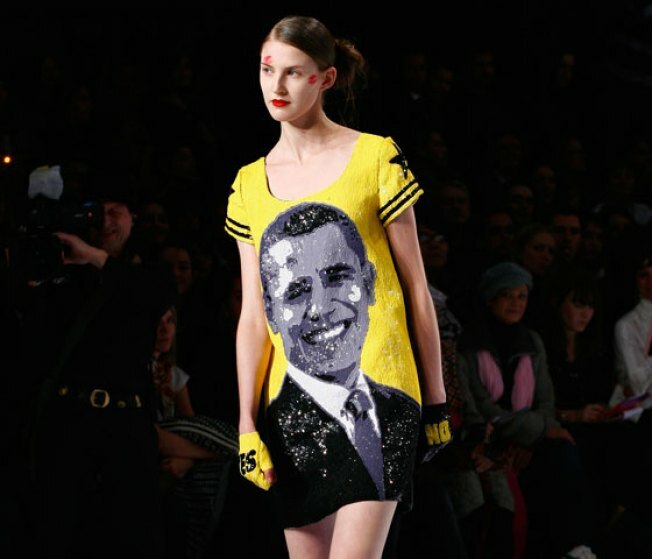 Behold the Obama dress as seen in the Jean-Charles de Castelbajac runway show. Well, we all saw how well Barack Obama's visit went over in Berlin a few months ago, and now it appears he's a big hit in Paris too. And he hasn't even visited Paris since he was nominated! Has he? Surely, he hasn't or we would have seen countless pictures of him laughing and radiating charisma at some sidewalk cafe with Carla Bruni, no? Anyhoozle, at this year's Paris runway shows, two designers got tongues wagging when they sent models down the catwalk giving not-so-subtle nods to the presidential candidate. Veteran designer Sonia Rykiel sent two different sweater sets down the runway with one sporting the phrase "I Have a Dream," and then another boaty little number with "Obama" written across the chest like a college logo. Trop fou! In a somewhat flashier nod, notoriously kooky designer Jean-Charles de Castelbajac sent out a bright yellow dress with Obama's grinning visage emblazoned across it. And though that may sound a bit outre, it was actually one of the most wearable pieces in an otherwise predictably absurd collection. But what does it all mean? Are these designers trying to hypnotize the globe with their own political preferences? Is it some sort of veiled fashionista threat? Or is it no more than designers indulging in a little social commentary about new ideas, pop culture and iconography? We may never know, but there does seem to be something in the air over there. Even Stella McCartney, though she didn't plaster any names or faces on her designs, made a little statement of her own that was not quite so... er, subtle. At the bottom of her program notes, she wrote, "P.S. Vote Obama!!" Of course, not all the designers jumped on the bandwagon. Most of them just sent their own brands of crazy fabulousness down the runway with nary a political statement in site. See for yourself.